The Itty Bitty Kitty Committee: Howdy, Handsome. My heart is officially stolen even if he is giving me the raspberries. Oh hai Mr. Moo Moo! As Annie said - It's a cow kitty! Those nose spots are awesome! Izza cutie little cow kitteh! And ooh, he is gonna be trouble! Holy Kitty! He is A-dorable! Big ole thumbprint on his forehead! And one ear of each color. Too adorable. There's nothing like a male cow cat--mine is the most dopey, lovey kitty around. cow kitties and dilute calicos - I think this litter is going to be amazing! And you are such a tease, Laurie! Oh my... A tongue and an eyebrow! FRANKly, my dear, I think you should give him here! It looks like Clement and Louise's brother! The tongue, people, the tongue! All right Laurie, this little man is adorable. Ok, I am in love! Another SQUEEE here... that darling little tongue and come hither look... swoooon! Eeeeeeeee!!!!! Or should I say mooooooo?!! I love the tongue...and the ears! @Anon: He could be one of the Anderson-Ericksons! He's stolen my heart with one lick. If only I lived closer I would put my name down for adoption immediately because that is the cat for me. oh my stars!!! how completely adorables!!!! 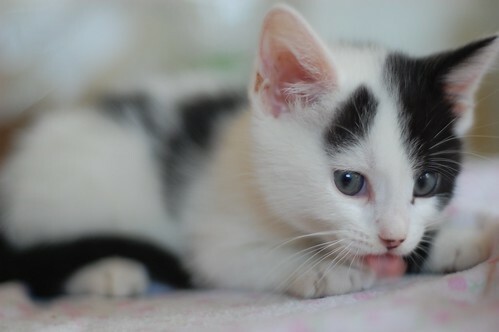 who doesn't love a holstein kitten? What a sweet kitten! Love the cow kitties. Their markings are so amazing! Wotcha nom'ing on their wee kitteh? Squee! What a cutie! And he really does look like a lost Anderson-Erickson! 2 down, how many more adorablenesses do you have?! I can't stand the suspense! OMG...that there's a "Moo Cow" kitty! SO AWESOME! Kate B--Actually he looks like a reverse A-E so that would make him and Erickson-Anderson! Laurie--I assume you've already gotten offers on this fella and the calico from yesterday. Wowee - Young "E-A" is so daggone adorable and soon to be handsome!!!! He looks just like Rhett Butler. If I could post an image here, I would. Names, histories (short for such wee kittens), and LOTS more photos please. Oh my, a little cow kitty with one rakish Groucho Marx eyebrow. Be still my beating heart! His name simply has to be "Petey"
My heroes have always been cow boys. I just really, really wanna name this one William. Because, I dunno why, but he reminds me of Will Turner from Pirates of the Caribbean.